We have received many awards over the last 20 years and continue achieving standards that standout in Nottinghamshire. We are delighted to announce that the AA Inspector has once again awarded the restaurant the coveted award of an AA Rosette for Culinary Excellence and the hotel continues to be awarded Four Stars at the Silver level with a commendable merit. Reserve a table to sample our ever-changing seasonal menus soon here. The AA introduced a star rating system to classify hotels in 1912, and then started rating restaurants in 1955, when the first AA Rosettes were awarded. Since then the AA Guide has remained one of the most well respected and comprehensive guides in the UK, awarding a significant number of restaurants in the UK and Ireland a coveted rosette. Out of the many thousands of restaurants in the UK, the AA identify over 2,000 as the best by awarding them Rosettes for culinary excellence. The Rosette is an award rather than a classification, and they are awarded annually on a rising scale of one to five. 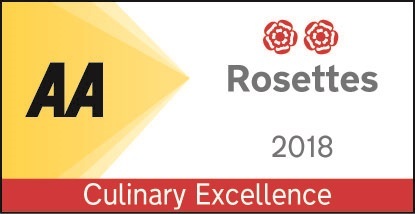 One rosette indicates restaurants that stand out in their local area as using good quality ingredients prepared with skill and understanding. Two rosettes show excellence and consistency in the cuisine with a good degree of precision in the food preparation and obvious care in selecting the ingredients. Nottingham is also home to Sat Bains one of the 14 restaurants to receive a 5 AA Rosette, so Hart’s are in good company in being awarded this accolade.